In addition to our online catalogue we provide a full range of services in curtains, linens and blinds. Electronic curtains and blinds can also be purchased. Curtains can be joined, have their heading changed or altered in any way. We can advise on the most cost efficient options available. 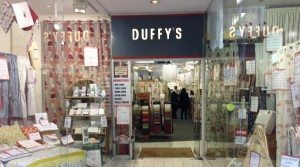 Contact us by phone (+353-1-8744606), email (sales@duffyscurtains.com) or in person at 27 North Earl Street, Dublin 1 to avail of any of our services above.